According to Hindu calendar Amla Navami is observed on the ninth day of the Shukla Paksha (waxing phase of moon) of Kartik Month. This ritual is dedicated to Amla or Awla tree. This ritual is also called 'Arogya Navmi’, 'Akshay Navmi’ and 'Kushmand Navmi'. It is believed that 'Satya Yuga’ began on this day hence this 'Navami’ also known as 'Satya Yugadi'. According to Hindu Mythology those who observe this ritual get rid of all their sins. 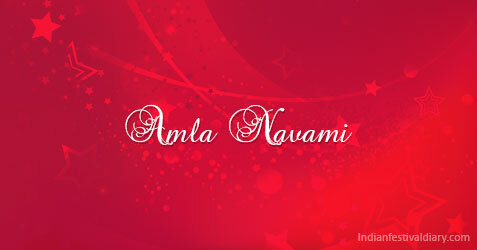 The greatness of ‘Amla Navami’ is mentioned in ‘Padma Purana’ and ‘Skanda Purana’. It is said that during Kartik Month Gods and sages reside on Amla tree. According to ‘Puran’ the person, who will do any charitable or devotional activities, will get the reward of doing this not only in this life but also in next life but if you will do bad things on this auspicious day we will get bad result. Amla tree is worshiped on this day. Devotees wake up early in the morning and after taking bath wear clean cloth. They gathered under Amla tree to worship it. Devotees sit under the tree facing toward east to perform Puja. They first lit Dhup and Deep (Lamp) before the tree and then they put Tilak on the tree and wrap red coloured thread around the tree as they do Prikrama (walking around the tree). Then devotees offer food, money and cloth to Brahmins. Devotees then take food including Amla (Goose Berry). Once a childless woman sacrifices her neighbor’s son to Bhairab Devta to get a male child. But as the result of performing this sin she got leprosy on her whole body and the ghost of that child began to haunt her. At last she told entire story to her husband. After listening his wife’s wrong deeds he was very angry with her but seeing her adverse condition he became sympathetic to his wife and suggests her to worship Ganga Mata to get rid of this curse. She started worshiping Ganga with full devotion. Ganga Mata was very pleased with her devotion and visited her in a form of a old lady who tales her to worship Amla tree on Kartik Navami of Shukla Paksha to relief from all the sins. The women did everything as she was told by Ganga Mata and got relief from all suffering. She regains her health and blessed with a son.